If you follow me on instagram, you know I clearly have an obsession with plaid. I can't help but think it's the only print for fall. Okay, maybe a dash of leopard also fits, but plaid is my main squeeze this season. I especially love this shirt paired with my favorite J.Crew Pencil skirt. It's the perfect pair for a day at work. 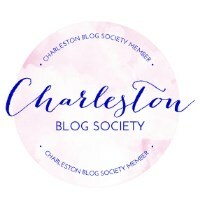 Linking up with 2 Cats & Chloe and Bless Her Heart Y'all at their Celebrate Southern link up and Lauren's Style Sessions link up. Head on over and check them out! Hello Caitlin, I am Ada. I am so glad I found your blog. You got a new fan and follower. I love this outfit and would wear it as is, head to toe. 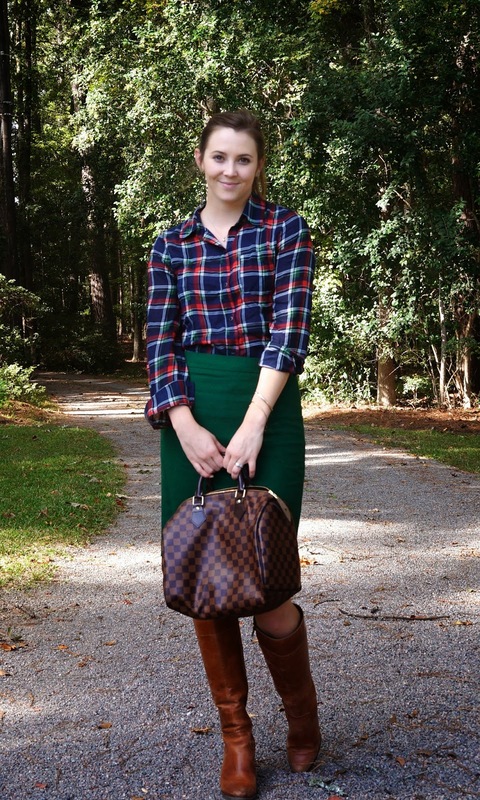 I think I need a Hunter Green Pencil Skirt and of course more Plaid Shirts. I welcome you to check out my blog and hopefully you will support me back by following as well. Loving this outfit girl!!! I would have never thought to pair that plaid shirt with that beautiful green skirt but it totally looks amazing!! I seriously need that pencil skirt!! This outfit is FABULOUS!!! 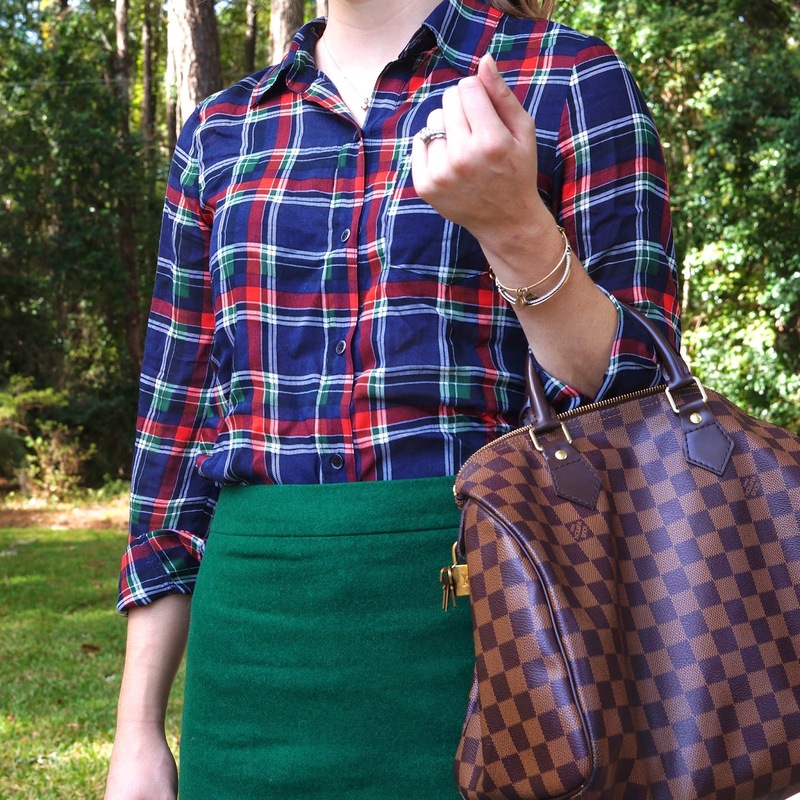 I love how the pencil skirt and plaid just flow perfectly! I think this outfit is perfect for my linkup, Tremendous Tuesday! I would love if you could stop by some time today! Absolutely love this look! And it is perfect for the office -- especially mine! I love the colors in your outfit. 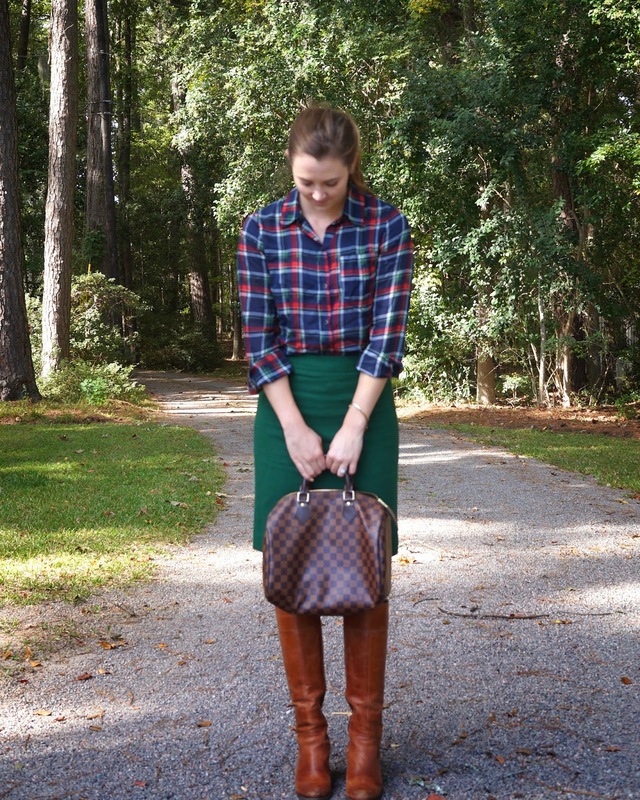 It is very Ralph Lauren with the plaid shirt and emerald green pencil skirt! Thank you for the inspiration, Caitlin! You look so fall! (I mean that in a good way!) Love the color combination, now all you need is a Pumpkin Spice Latte and you really are the poster child for the fall season! I love your simple outfit. Pencil skirts are my favourite as they're so flattering. I love the shade of green with the plaid shirt, perfect for Autumn, You look fab! So much love for this as I'm currently wearing a plaid skirt to my office! Plaid is totally office appropriate! Found you through SBS btw, and loving your stuff! I have an obsession with plaid too...and stripes...and leopard print...and...I could go on! Anywho, I absolutely love your outfit. The green skirt needs to be in my closet immediately - what a great find! Gorgeous look girl! I love your green skirt that brings out the green in that plaid. So pretty on you! 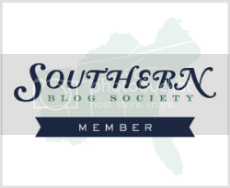 Thanks for joining Celebrate Southern link up this week my dear! I hope to see you back again on Tuesday! Happy Halloween!